If you are a Spectrum phone user, you may experience certain issues while using it. These issues may include problems like no dial tone, poor call quality or trouble in making or receiving calls. 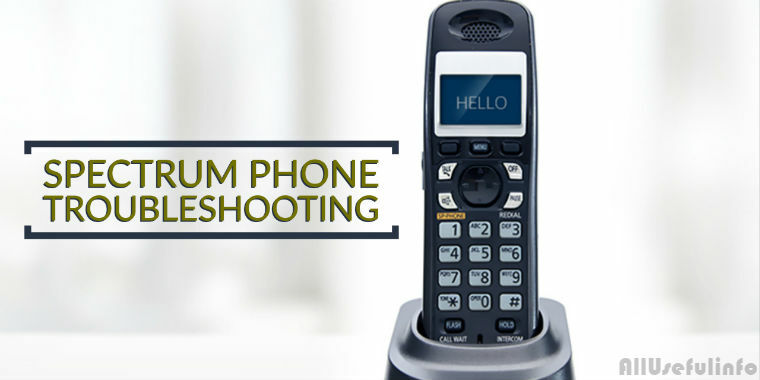 In such situations, you may need to follow some basic troubleshooting methods to get your Spectrum phone reconnected. If you have only one phone number then, the phone line must be connected from the “Line 1” at the back of the modem to the phone and the coaxial wire must be connected from the splitter or the cable outlet to “Cable In” at the back of the modem. If you have another phone number, make sure that the phone line is connected from the phone to Line 2 at the back of the modem. Also, if you are using a cordless phone, make sure it should be plugged into an electrical power outlet. Now, check your phone for a dial tone. If you do not find the dial tone, continue with the next troubleshooting method. Disconnect the phone that is connected at present and try connecting another phone. Now, check for the dial tone and previously occurring problems in this newly connected phone. If after doing all this, you can hear the dial tone, and everything seems to be working right, this is an indication that the problem is with your phone or handset. Replace it with the new one. However, if still there is no dial tone, go ahead with the next method for spectrum phone troubleshooting. First, you need to disconnect the cord which is connected between the telephone wall jack and the modem and then connect the modem and the phone to another telephone wall jack that is available at your place. If now, the dial tone is established, and the issues are resolved, you must call Spectrum customer Support to get the faulty telephone wall jack repaired. However, if still the problem persists, try resetting your modem. Unplug the power cord directly from the electrical power outlet or from the back of the modem. If you are using a battery backup due to which the power light of your modem remains on then, you may need to remove the battery also. In case you are using a wireless modem, you may require pushing the reset button to reset its wireless configuration and you may call Spectrum tech support to reset your wireless router. Wait for at least five minutes and plug in the modem back to the power outlet. Wait for ten minutes more to allow your modem to reset. That’s all. Check whether the issue is resolved or not. If still you are facing the same issue, call Spectrum support. Well, I hope these 4 methods will be helpful for you troubleshoot issues with your spectrum phone.